to increase your productivity and improve product quality. 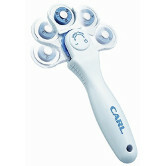 The CC-10 is perfect for all types of free form design cutting, its pivoting head ensures optimum cutting pressure. 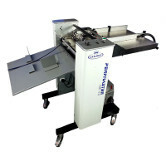 It can be used to cut and trim film, paper, cloth, felt and much more. 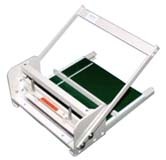 The DC-210N is a heavy duty 36 sheet rotary paper trimmer, perforator, and scorer. 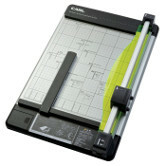 It cuts cardstock, artist board, plastic sheets and more. The patented locking rail mechanism and luminous paper holder is made of acrylic that pipes light to the cutting line, making cutting easy and accurate. 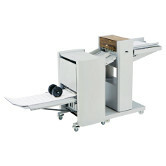 The DC-220N is a heavy duty 36 sheet rotary paper trimmer, perforator, and scorer. 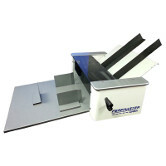 It cuts cardstock, artist board, plastic sheets and more. The patented locking rail mechanism and luminous paper holder is made of acrylic that pipes light to the cutting line, making cutting easy and accurate. The W630 Score II Perf & Score Series Machines are rotary designed units with extreme accuracy and include interchangeable perforation and scoring blades. 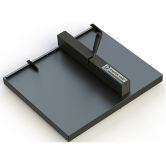 The Score II perf tools offer a wood base and can perf/score up to cover stock. 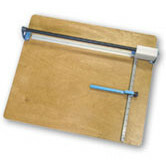 The CR135 Manual Creaser can score paper widths up to 13 5/8” and as deep as 12 1/2". The CR135 Manual Creaser is designed to score/crease documents or prints that can be damaged easily due to cracking of printed ink. There are two types of scores that this machine will do. NEW! The new Martin Yale CR818 is simple and economical to use. Just unpack the machine, adjust the paper stops, and pull the lever to crease a sheet. 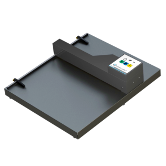 Now you can do those short run scoring and perforating in house, with quick and easy setup. With Handi-Score you can score tent cards, brochures, menus, greeting cards and more! Also perforate sales tickets, raffles tickets, business forms, etc. NEW! The new Martin Yale CR828 is the easiest creaser to use yet. Just unpack the machine, plug it in, adjust the paper stops, and you're ready to go. The PerfMaster Dash 18" semi-automatic perforating & scoring machine offers a self fanning automatic top friction feed, which allows for continuous feeding without stopping and features a simple to use one button control. 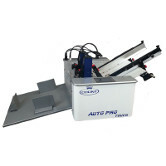 Feeds single sheets, coated stock or multi-part forms, open or glued edges. The hand crank is geared to produce thousands of sheets per hour and a very economical price. 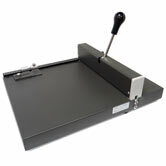 The PerfMaster Sprint 18" automatic perforating & scoring machine offers a simple to use one button control. 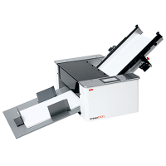 You can feed single sheets, coated stock or multi-part forms, open or glued edges. 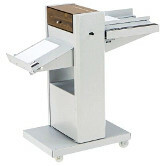 Creases up to 2,000 sheets per hour and accommodates sheet sizes up to 39 inches. 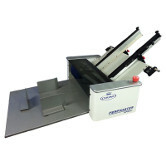 Runs on-line with MBM Creasematic 150 to produce a single fold on creased stock. 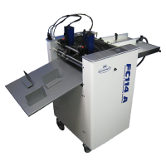 High speed knife fold system will not mark digitally printed stock. 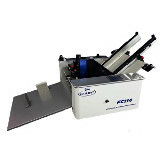 The Perfmaster Air V3 is an 18" automatic perforating and scoring machine. It offers a self fanning automatic bottom air/ suction feed, which allows for continuous feeding without stopping. The icrease EXCEL is a medium production, friction feed automatic die-creaser with in-line perforating capability. It features a touch screen programming module with automated distance recognition for automatic set-up of your most common jobs.